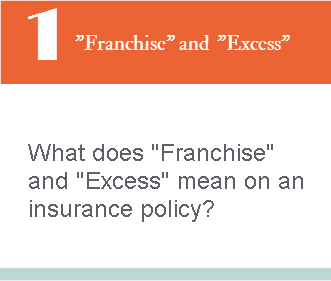 What does "Franchise" and "Excess" mean on an insurance policy? Sometimes insurance companies, insurers, would like to limit their risk exposures, especially when certain damage of the goods is an ordinary expectation throughout the related sector. In such circumstances insurance companies add technical insurance terms,"Franchise" and "Excess", to the insurance policies, in order to limit their financial responsibilities. On this article I will try to explain the meanings of "Franchise" and "Excess". What does "Franchise" mean on a cargo insurance policy? What does "Excess" mean on a cargo insurance policy. Franchise determines minimum threshold of the insurance companies' financial responsibility. Insurance companies will not be paying any amount for the losses, which do not pass the mentioned franchise value on the insurance policy. If the losses exceed the franchise amount, then insurance company covers full damage. A franchise exists when the insurance company is not responsible for the loss which does not exceed an agreed amount, but is responsible for the entire amount of the loss which exceeds the agreed amount. An importer from USA buys pastry cabinets from Brazil by sea shipment with FOB trade terms. In order to secure the goods against loss and damage during the transportation, importer company has purchased an All Risks cargo insurance, which is subject to Institute Cargo Clauses (A). Insurance company told the importer that insurance policy could only be issued with a 10% Franchise clause, due to the fact that pastry cabinets contain display windows from glass materials. Total amount of the order is 30.000USD. Insurance coverage is 33.000USD. Situation 1: On arrival importer declares that goods have been damaged during the transport and claims 2000USD from the insurance company. Insurance company's reply: Aforementioned damage's financial value, 2000USD, is less than franchise amount, which is indicated on the insurance policy as a result we cannot make any payment for your losses. Damage : 2000USD => No payment. Situation 2: On arrival importer declares that goods have been damaged during the transport and claims 4000USD from the insurance company. Insurance company's reply: Aforementioned damage's financial value, 4000USD, is more than franchise amount, which is indicated on the insurance policy as a result we can pay full damage amount if your claim approved by surveyor and supported by your complying documentation. Damage : 4000USD => Full damage recovery. Excess determines how much of the claim should be covered by the insured company. Damages up to excess amount will not be compensated by the insurance company. For the damages, which are above the excess limit, insurance company's responsibility is restricted for the amount over the determined excess level. An excess exists when the insured agrees to be responsible for an agreed amount of loss, and the insurance company is only responsible for the amount over the agreed amount. An importer from UK buys gelato showcases from Italy by multimodal shipment with FCA trade terms. Insurance company told the importer that insurance policy could only be issued with a 10% Excess clause, due to the fact that gelato showcases contain display windows from glass materials. Total amount of the order is 50.000EUR. Insurance coverage is 55.000EUR. Situation 1: On arrival importer declares that goods have been damaged during the transport and claims 5000EUR from the insurance company. Insurance company's reply: Aforementioned damage's financial value, 5000EUR, is less than excess amount, which is indicated on the insurance policy as a result we cannot make any payment for your losses. Damage : 5000EUR => No payment. Situation 2: On arrival importer declares that goods have been damaged during the transport and claims 10.000EUR from the insurance company. Insurance company's reply: Aforementioned damage's financial value, 10000EUR, is more than excess amount, which is indicated on the insurance policy as a result we can pay partial damage amount that is fall over the excess amount, if your claim approved by surveyor and supported by your complying documentation. 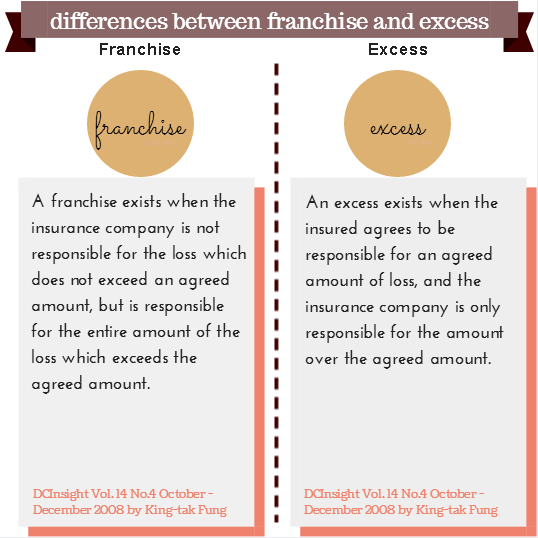 What is the difference between "Franchise" and "Excess" on an insurance policy?